I’m not a light sleeper and in general my dog’s collar tags do not keep me up at night. Occasionally I’ll hear the jingle of tags in the middle of the night, but I have no problem falling back asleep. So why do I need the Quiet Spot Pet Tag Silencer? One reason…the jingle of pet tags is annoying! I’m trying to watch a movie…jingle, jingle, jingle…I’m trying to read a book…jingle, jingle, jingle…I’m trying to write to my blog…jingle, jingle, jingle. The Pet Tag Silencer saves the day and puts an end to all that jingling. I first saw the Pet Tag Silencer on one of our fellow guide dog puppy’s in training. Darla was the puppy’s name and she’s actually a breeder in the guide dog program. I spoke with her caretaker, Mark who gave the Pet Tag Silencer the thumbs up. Lucky for me our group sells this product at our group meetings, so last month I picked up a Pet Tag Silencer for Stetson (he wears 5 different tags) to see if we liked the product. 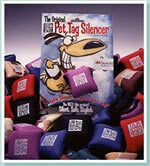 Tag noise attracts unwanted attention from other dogs – the Pet Tag Silencer puts an end to that noise. Keeps the information from wearing out on your tags (Linus already wore out his first set of tags). Assistance dogs can better blend into public places without tag noise. As a part of this new partnership, Itzadog will donate a Quiet Spot Pet Tag Silencer to every Guide Dogs for the Blind Guide Dog upon graduation and placement with their new partner. 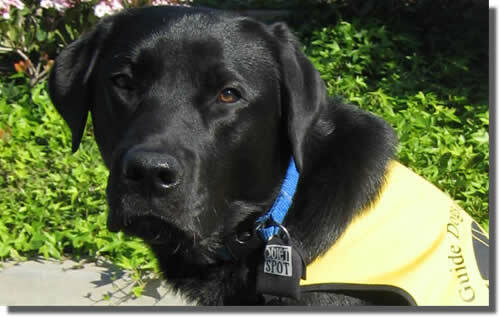 Among the many benefits of using Quiet Spot, perhaps the most important to assistance dogs is the ability to remain unnoticed and unmolested by loose and potentially aggressive dogs. “By not attracting any unwanted attention from other dogs, an assistance dog can remain focused on their job,” stated Itzadog founder Scott Schaible. “The main reason dogs bark and charge the fence when you walk with your dog is because they HEAR the jingling tags,” he continued. According to Guide Dogs for the Blind, there has been an increase in the number of attacks upon guide dogs in recent history. When a loose dog attacks an assistance dog, in addition to being a very traumatic experience for everyone involved, the assistance dog oftentimes is unable to resume official guide responsibilities and must be retired. Quiet Spot helps assistance dogs to blend in and go unnoticed by potentially aggressive dogs as well as humans who don’t realize that they should not pet or distract a working dog. I currently puppy raise for Guide Dogs of America, but I think it’s great that Itzadog has this partnership with Guide Dogs For the Blind. We went with the black tag to match the color of Stetson’s coat. If you’re interested in this product you can purchase it by clicking on any of the Pet Tag Silencer links. However, the cheapest price I’ve seen online is $7.99 plus tax and shipping. I purchased my Pet Tag Silencer through our Orange County Guide Dog group and it only cost $5.00. If you’re local to Orange County and interested in a Pet Tag Silencer then let me know and I’ll do my best to get you one through our Guide Dog group. Or just come visit us at our next Orange County Guide Dogs of America meeting in Anaheim, CA. Our meeting information is posted on the OCGDA website. Do you have problems with pet tag noise? 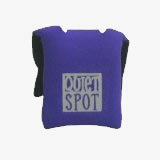 Do you own a Quiet Spot Pet Tag Silencer? I’d love to hear about your experiences.